Eddie Jones has labelled Ireland the Six Nations "favourites" and then questioned whether Joe Schmidt's side will be able to handle the expectation that goes with the tag. Ireland and England don't meet until the final game of the Championship on St Patrick's Day in Twickenham but the Australian clearly has the men in green in his sights. "Ireland have got a centrally-contracted system, their players are in great nick, their three provinces have done well in the European club system… England have all these injuries and we don't have central contracting," he said. "We're lucky to have one side in the European club championship (quarter-finals). So how can we compete?" "It's different (being favourites), isn't it? You go into a major tournament - and this is one of the major tournaments in the world - if you go in as favourites it comes with massive expectations. "Fans, supporters, media, sponsors…. It's how you react to that expectation, but they've got a great coach and they've got good leadership in the team so I'm sure they'll be able to handle it. "But there's always that question there…"
Asked if he thought the tournament would come down to the final game at Twickenham, Jones neatly side-stepped and instead heaped more pressure on Ireland who face a difficult opener away to France in Paris. "I'm sure all Ireland are worried about is the tricky game they've got first up against France," he said at yesterday's Six Nations launch in London. "That's a tricky game. I wouldn't like to be playing France first with Jacques Brunel in charge of that team. You don't know what they're going to produce. I'm sure Joe's got his side concentrating on that. "Look, if it happens, it's going to be fantastic. Both teams hope it happens." 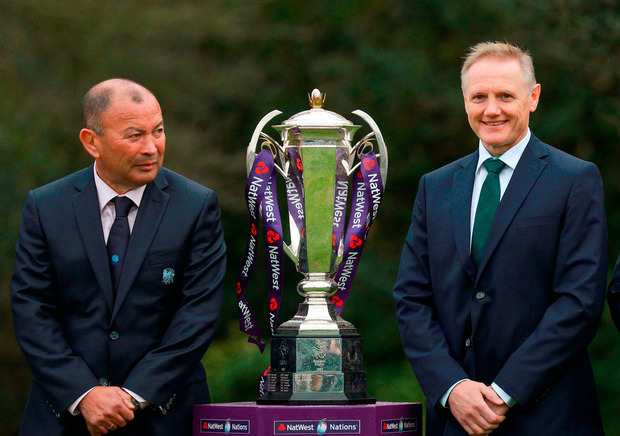 Asked about Jones' comments about his side, Schmidt said: "Bookies don't make money by being wrong. "You've got a team there that's won 22 out of 23 Test matches over the last two years. They've beaten everybody they've come up against at some stage. "As much as we might have been the team that managed to knock them over last year, the year before that they beat us at Twickenham. "They're back at home when they play us. You've got a number of other teams that will be very competitive."